Making this basic barbecue sauce takes mostly pantry ingredients and about 20 minutes over the stovetop as you cook the ingredients together. I would say the only "hassle" is the spatter. You know how it is when you cook tomato sauce and it splatters once it comes to a boil (interesting article from The Kitchn about that), and you can expect the same here. Covering it with a lid isn't really an option since you want to let the barbecue sauce cook down and thicken. I simply stir often and resign myself to a little mess that I can quickly wipe clean after the sauce is done. Once made, I cooled it down and stored it in a glass container. I didn't keep this first batch of sauce for more than a couple of days in the fridge since we used it up quickly. Since there is fresh garlic in this recipe, I probably wouldn't keep it in the fridge longer than a week or two. If you'd like to keep it longer, consider using garlic powder instead of fresh. We used the inaugural batch of sauce to grill chicken drumsticks and then some legs on another day over Memorial Day weekend. My husband starts applying the barbecue sauce to the chicken (which I've rubbed with a bunch of spices) about 5-10 minutes before the chicken is done so as not to burn the sauce. They were finger-licking good! Here's to plenty of sunshine and good weather for cookouts and happy living this summer! Place all the ingredients in a small pot and cook, uncovered, over medium-low heat. The mixture will bubble as it cooks. Stir occasionally and cook until thickened and flavors are combined, 15-20 minutes. Monica your chicken looks wonderful. I adore grilling and it does seem more relaxed than cooking indoors - all by myself :) I am sure your family loved this recipe. I make something similar and it's my husbands favorite sauce ever. Thanks! Have a great week. Wha a lovely sauce! York chicken must have been very tasty! I'd love to give it a try! This reminds me of my childhood as my dad used to make barbecue chicken for us all the time. It's so summery and so delicious! Your sauce looks and sounds wonderful. Grilling and barbecue chicken are definitely great memories from summer. Yay for grilling season! It's my favorite since the husbands get to take over the cooking :) The chicken and that barbecue sauce look amazing! I love a basic barbecue sauce, the flavors sound perfect! So delicious and finger-lickin' good! Sounds quite simple. I must give this a try too. Hi Monica, I'm the sous-chef during grilling season here as well, love summertime. Your chicken turned out beautifully, love the color. I have to admit that my condiment addiction is ketchup...but a simple homemade bbq sauce was just what I needed in my repertoire. I love grilling too for that reason! I prep everything and then the husband takes over - it's always so nice to sort of cook together for a change! 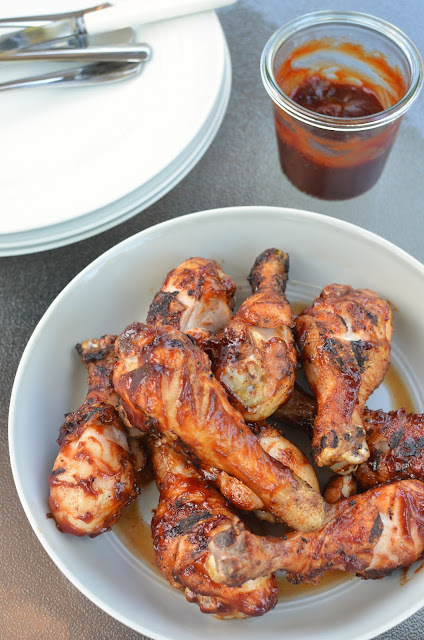 I love homemade bbq sauce - this looks awesome! And all the possibilities to use it with summer ahead! 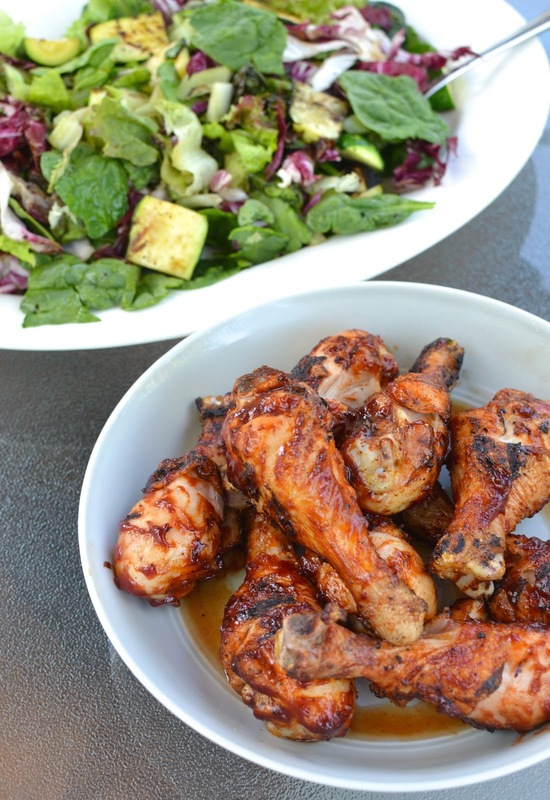 I often just buy BBQ sauce but I like this simple no-frills recipe! That chicken looks perfect. You can never go wrong with BBQ sauce, a staple for the summer months. It's great to know I can make some myself so easily. I was shocked when I discovered how easy BBQ sauce is to make...and how much better it tastes when you do make it yourself! I have never made barbecue sauce...now I am inspired to try your recipe...thanks for the inspiration Monica...it sure sounds delicious! First for me too and it is so easy, the flavors are so present. Have a good week! I think the spending time outdoors together is part of the appeal for sure. Thanks, Maggie! I love making my own condiments…but by no means do I make all of my own, all the time. 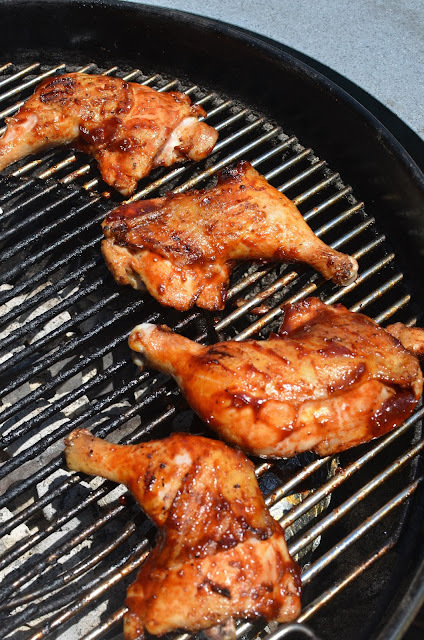 This bbq sauce sounds amazing – such a mouthwatering combination of flavors and look at that grilled chicken, look so yummy! Monica, these chicken are nicely charred!!! I really want some! BBQ sauce is one of those things that sounds really complicated, but they are in fact very easy to make. And we can always adjust the sauce to our liking. Much better than buying from store! I have only made 1 kind of bbq sauce, which is a peach-bourbon one. Sweet and tangy. Yours seems very savory. I would love to try that next time! I just had chicken wings for lunch actually, but your version looks so much better! I've always disliked store bought BBQ sauces, but never thought of making it myself, will be trying this recipe out! It's really easy and if you ever have time for a family cookout or gathering, it's totally worth a go. Hope all is well! Wow! Such mouthwatering photos. I do like to make sauces from scratch and have tried out a few versions of barbecue sauce...the most adventurous one being a chocolate version. It tasted alright but the chocolate was lost somewhere so I decided to reserve chocolate for desserts only:-( Your recipe looks perfect with the right consistency and colour. This is a good place to start for me. We don't use a lot of barbecue sauce but when we do, a homemade one is sure a great option. Enjoy all the grilling and chilling this summer!